McCain in swing states, according to a new poll. 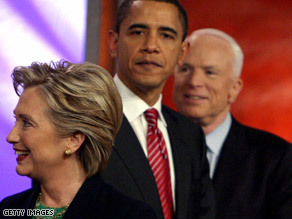 CNN Political Ticker has reported that in potential match-ups in November, both Democratic presidential candidates Barack Obama and Hillary Clinton are leading presumptive Republican nominee John McCain in states that were decisive in the 2004 election according to a new survey. The latest Gallup Poll conducted during the first 15 days in April, consisting of more than 13,000 registered voters shows Obama and Clinton ahead by 4 points in so called “purple” or swing states with 47 percent to McCain’s 43 percent, with a margin of error of plus or minus 1 point. But in “blue” states where John Kerry won by more than 6 percentage points in 2004, Obama has a comfortable double-digit lead, while McCain leads by a slightly smaller margin in the “red” states where George Bush prevailed by more than 6 points. Clinton has the same lead over McCain in purple states, but she does not fare as well as Obama in the “blue” states and also trails McCain by a larger margin than Obama in the traditionally Republican “red” states. The remaining purple swing states where Bush or Kerry won by 5 points or fewer in 2004 include: New Hampshire, Pennsylvania, Ohio, Michigan, Wisconsin, Minnesota, Iowa, Florida, Colorado, Nevada, New Mexico, and Oregon. ← Hillary as NY guv anew?